Anna is an accomplished and international professional speaker that enjoys sharing the story of Terrafugia, her love of entrepreneurship, and personalized lessons learned along the way. She has spoken at key industry events, taught in university settings, and appeared on Good Morning America, Fox and Friends, and other TV appearances. She is particularly passionate about speaking to groups of students and setting an example of a possible career in STEM. She has lectured at world-class institutions, including the Massachusetts Institute of Technology, Olin College of Engineering, University of California Berkeley, and Embry Riddle Aeronautical University. Additional professional information and video clips of Anna are available here. 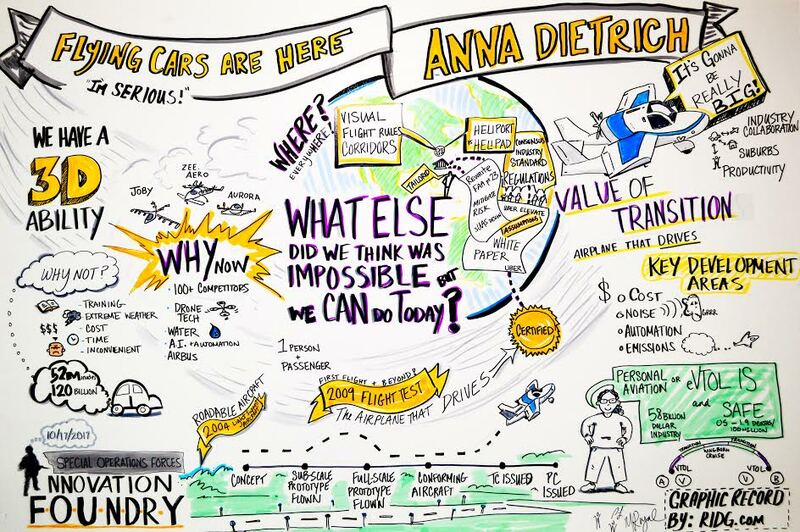 Anna was the Keynote Speaker for the inaugural Special Operations Forces (SOF) Innovation Foundry, a workshop focused on conceptualizing futuristic technological concepts. Her presentation stepped us through her personal experiences with innovation and perfectly set the stage for the remainder of the workshop. Anna’s insight was great value added for educational purposes and expanded the aperture for the realm of the possible. Anna demonstrating the Transition on Good Morning America in Times Square. Click image for video link. “Students attending Envision’s NYLF: Engineering & Technology conference thoroughly enjoyed hearing from Anna. We were honored to have her participate and share her experience, enthusiasm, and invaluable advice as she inspires the next generation of engineers to turn today's "impossible" into tomorrow's reality." "After listening to Anna's presentation, my daughter has been inspired to become an engineer. She informed me that 'she wants to design new things'. As we drove home, she informed me that she no longer wants to grow up and become a dance instructor. She wants to be an engineer like Anna. She asked me if I would get her a chalk board so she could draw her designs ( as she saw Anna had done)." "The BBC carried a piece about flying cars which led me to Terrafugia's website and so to this talk. Anna and the concept are both truly inspiring.... It takes a visionary then progressive development in the face of disbelief to get to the stage where the world gets it. Thanks TED for another great talk and best of luck Anna and Terrafugia!" For more information on Anna, including highlighted speaking engagements and awards, please click here. Please include the following information in your message: - Specific date(s) and duration of talk(s)? Time for Q&A - What size audience is expected? - What budget is available to cover travel costs and/or a speakers fee? - What "durable A/V" will be produced and how will it be shared (as in, will there be an online video)? - Is there a key message that you're hoping the audience will take away from having Anna speak? Thank you for your interest. Anna or a member of her team will be in touch as soon as availability allows.